These days almost anyone can have their own cigar line, if they have the cash and a name to put on the band. Such cigars can be excellent or lousy, mostly depending (I suspect) on the degree to which the brand owner knows and cares about insisting on a quality product. Selecting a good partner to make the cigar for you helps too, I’m sure. So I really didn’t know what to expect when I was offered samples of Señor Rio cigars, two cigar blends from the owners of the Señor Rio tequila line. In the introduction email I received, Señor Rio co-owner Jonathan Gach said his direct enjoyment of cigars goes back to the late 1970s, plus even longer if you count enjoying the aroma of the cigars his father smoked. Further emails revealed he had traveled to Nicaragua and worked with A.J. Fernandez on his two cigars: Señor Rio Añejo and Señor Rio Diamanté, the latter of which I’m reviewing here. 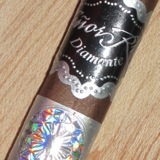 The Diamanté blend has Nicaraguan binder and filler from Estelí, Ometepe, and Condega, wrapped in a medium-brown Ecuadorian Habano wrapper. The dual bands surround a fun-sized (5 x 40), box-pressed smoke. It’s a quirky size for introducing a blend, but it works. It’s available for $7.99 at Total Wine shops around the country, as well as a growing number of other cigar retailers. The well-constructed cigar has an easy draw that reveals an interesting combination of medium-bodied flavors. There are bready notes, a slight habanero spice, and coffee flavors, along with a unique, crisp, almost belt pepper taste. There’s not much variation in flavor as the cigar progresses, as it maintains its medium- to full-bodied profile. The finish is long as the flavor coats the roof of the mouth. I started out saying I didn’t know what to expect from this cigar. Having smoked four of them, I’m impressed with the blend Señor Rio ended up with for Diamanté, no doubt in small part by choosing to work with A.J. Fernandez. It earns the Señor Rio Diamanté a rating of four stogies out of five. Never heard of these but I'll be on the lookout. Thanks for the review.